My black-and-white photo wall has been overdue for a change for a while. The photos themselves are simply printed out on my inkjet printer, and so after five or more years, they fade or yellow. It’s time for a change. 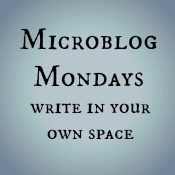 Wow, you really are the 1st #MicroblogMonday each week. I'm just getting ready to go to bed here in Utah, USA and it's already tomorrow for you. And it's not like it's that late here, it's not even 10 o'clock yet. Have a good day. Monday's work day only has an hour or so to go here! Sweet dreams. Don't worry - they're not as close together as this collage suggests! We have a wall that is about six metres high - and the photos just follow the stairwell (there's a photo of the photo wall on the link in my post), so there is plenty of white wall to soothe your eyes/mind. Ha -- I'll admit that I've thought the same thing. We have very few photos of the kids up on display because they're always right in front of me. Though I'll admit that I have few photographs up in general despite taking them incessantly. Love your b&w wall! I once stayed at the home of a prominent politician in Ottawa... the stairwell was lined with b&w photos of him with various political & cultural figures of the day, as well as family photos. I thought it was very cool. I've always wanted to do something similar with old family photos on at least one wall of our house but have yet to do so. I do have some old framed photos on the piano, though. Beautiful! Love the idea. Thanks for the Show and Tell! Similar philosophy. And I love the photos! Gorgeous! I love the canyon and the New-Englandy (but possibly Norwegian?) one on the right. I agree on photos -- giant portraits of just family members you live with are strange unless maybe you have face blindness. I love my best friend's house -- she has photos of her children EVERYWHERE, but doing interesting things or at specific events, not just your run-of-the-mill studio portrait or up-close smile. They're more pictures of that specific moment in time than pictures of her kids. Love your travel photos! Thanks. The canyon is the Siq at Petra in Jordan, and the New-Englandy one is Nova Scotia, Canada (so you weren't far off). I love that one too. Love the photos. I have a few pivs of my kids from when they were and fewer of them as adults-mainly because they are here in front of me-mostly because the are decent photos. "My loss meant I couldn't be there for my friend"